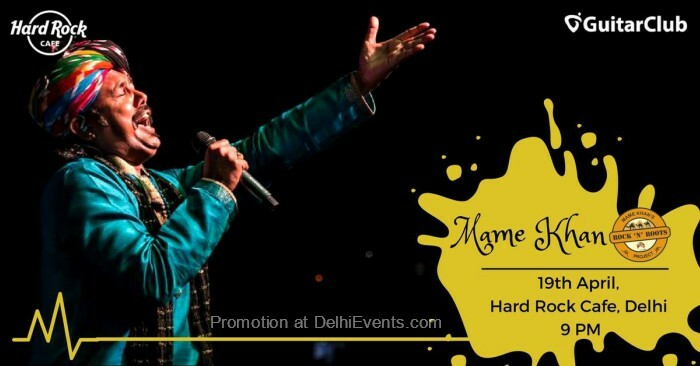 Event Description : MUSIC : Mame Khan (Rock'n'Roots Project) - Thursday Live! Mame Khan is hands down one of the best Folk singers that the country has ever come across. His name is highly regarded in Bollywood world as well. He YouTube videos have crossed 9 Million views. He has worked with amazing artists like Amit Trivedi, Shankar-Ehsaan-Loy, Ajay-Atul, Amitabh Bhattacharya, Harshdeep Kaur etc just to name a few. Welcoming you to the world of Rajasthani Folk and Sufi music! Mira Bai, Kabir, Lal Shahbâz Qalandar, Bulleh Shah and Baba Ghulam Farid..all at once! He sings a wide repertoire of traditional Folk- and Sufi songs. Mame Khan's Rock and Roots Project will leave you mesmerized! Come let's celebrate Indian music! Mame Khan belongs to a family of master singers, who perform a unique, oral tradition for more than fifteen generations. His energy and his vocal skill owe much to the influence of his father and tutor, late Shri Rana Khan. Mame Khan’s musical career started in a small, almost medieval village named Satto near Jaisalmer. The golden city of Jaisalmer and its surrounding villages are famed for their rich history of kings and poets and are a place where Muslim and Hindu mystical traditions come together -timeless and beyond borders. Mame Khan is a name that finds special mention and great respect among the folk music circuits of Rajasthan. Today he sings a wide repertoire of traditional Folk- and Sufi songs. The special style of the Manganiyar Folk Music called Jangra includes a universe of songs for all occasions in life. From traditional wedding songs to welcome songs for a newborn child; especially the happy occasions of life are accompanied by the strong and colorful songs of the Manganiyar Musicians. Also, the songs from Sufi poets of Sindh and Rajasthan, including Mira Bai, Kabir, Lal Shahbâz Qalandar, Bulleh Shah and Baba Ghulam Farid are sung by Mame Khan with élan and full of joy. His stage performances include the most illustrious national as well as international platforms. His voice has graced musical events and platforms in India and around the world from Europe to Africa from America to the Gulf Countries. He is as well the main vocal of the famous Manganiyar Seduction by Roysten Abel and he has borrowed his voice to some of the most popular Bollywood movies such as "No one Killed Jessica", "Luck By Chance" and " I am". Most recently he performed for Amit Trivedi's episode on Coke Studio season 2 @ MTV.